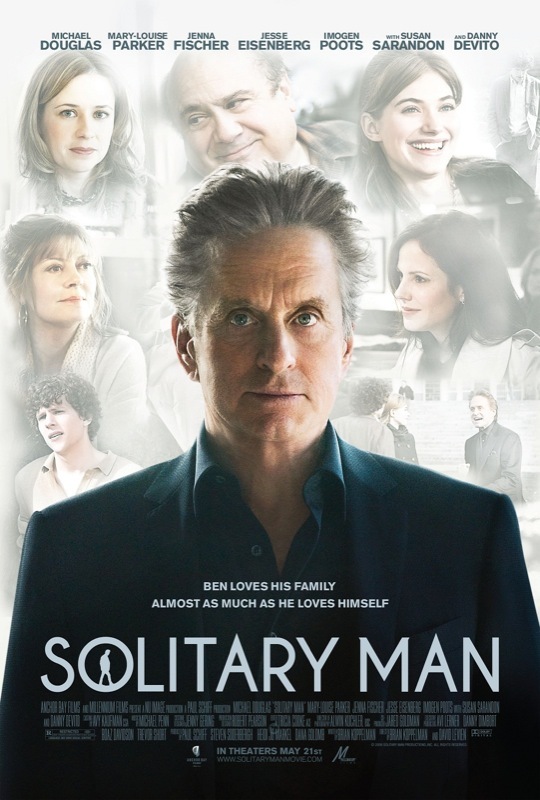 A few times during the film Solitary Man, Ben Kalmen (Michael Douglas) is out of focus. This filmmaking choice is just a literal representation of the man, who, after hearing that he may have some cardiac issues, decides to make all the wrong choices and has to deal with the consequences. He has a loving wife and family, and he throws them away to sleep with younger women. He has a successful chain of car dealerships, and he makes some shady business decisions that result in him losing his livelihood. All this is a gigantic case of denial: Ben can’t face the fact that he’s not the young guy he once was. As played by Douglas, Ben is a man on the decline. And it’s such a shame because he has so many things going right all around him that he just doesn’t want to see or acknowledge. Thankfully, Douglas seems to know full well what he has here and he makes the most of the role, giving a nice, lived-in performance. Douglas hasn’t been made to look younger here, like he is in other movies, and this adds another level to the characterization. Surrounding him is an excellent cast that includes Susan Sarandon, Jenna Fischer, Jesse Eisenberg, and Douglas’ old pal, Danny DeVito. It’s nice to see these two back on screen together again; they still have a warm chemistry after all these years. In a summer of flashy, big-budget releases, Solitary Man won’t be a stand-out performer. But it’s worth seeing for Douglas’ performance, and because you shouldn’t make the same mistake that Ben does, going after more attractive offerings at the expense of the quality things he’s already got. I’m giving Solitary Man a B+.